Stucco is a building material made from water, sand, lime and Portland cement. Applied to the exterior of structures, it features varying levels of texture depending on the desired look. 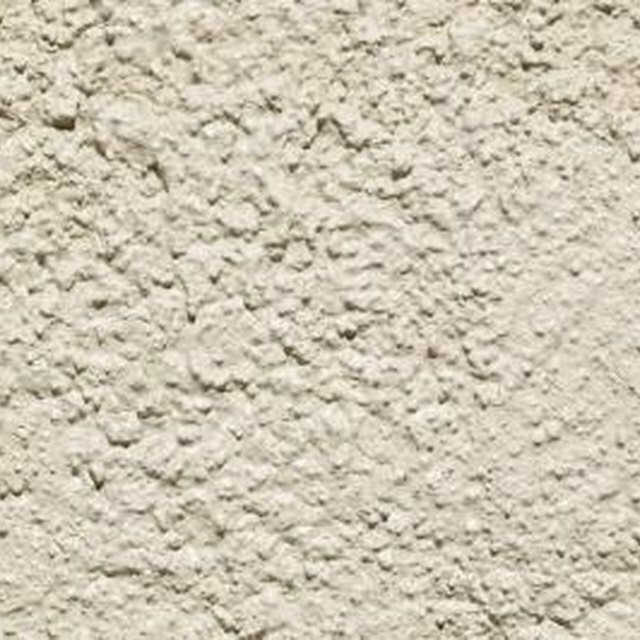 Installers may use a variety of stucco construction techniques based on the climate and the basic building structure. Stucco is a building material made from water, sand, lime and Portland cement. Applied to the exterior of structures, it features varying levels of texture depending on the desired look. Installers may use a variety of stucco construction techniques based on the climate and the basic building structure. To apply stucco over wood- or steel-framed walls, use a frame wall assembly technique. Start by covering the framing members with plywood or OSB sheathing. Cover this sheathing with two layers of building paper to prevent moisture infiltration. Use furring nails to attach a metal lath over the entire wall surface. The metal lath should be made from galvanized wire mesh and cut to size using wire snips. Once the metal lath is in place you are ready to install the stucco. The standard application involves three coats. The first coat is called the scratch coat and should be installed so that the stucco rests mainly within the wire mesh. A plasterer's rake is used to scratch the surface of this coat and provide a good base for the next application. The second coat is known as a brown coat, while the final application is called a finish coat. The brown and finish coats are carefully applied to give the wall the desired texture. When applying stucco directly over masonry brick or block, there is generally no need to add building paper or wire mesh. Instead, the wall should be wet down to see how well it absorbs water. If most of the water is absorbed, the wall is porous enough to bond with the stucco. If not, a concrete bonding agent should be applied to allow the stucco to adhere to the wall. Only two coats of stucco are typically applied over masonry. The scratch coat should be roughly 3/8 of an inch thick while the finish coat may be as thick as 1/4 inch. Installers should take extra care with this type of application to create the desired finish with only one coat of stucco. Depending on the angle and pressure applied when holding the trowel, the installer can produce a wide variety of textures on the finished wall. The most common is a medium textured finish known as "Lace" To apply a Lace finish, the scratch and brown coats should be allowed to dry overnight. The next day a heavy finish coat is randomly applied to generate texture. A beaded "Dash" finish is achieved by using an atomizing air gun to spray the final coat onto the wall. Smooth finishes require the use of a rounded trowel along with a high level of stuccoing experience. How do I Diagnose Water Heater Problems in a Watkins Hot Tub?